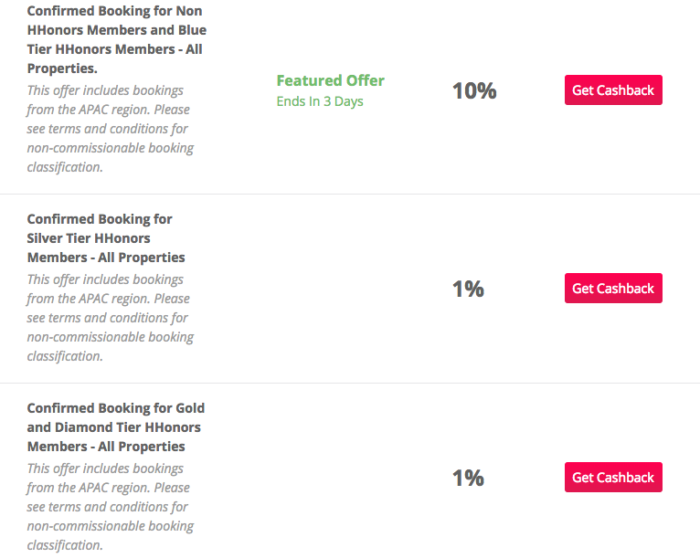 What’s the best cashback option on Hilton stays? 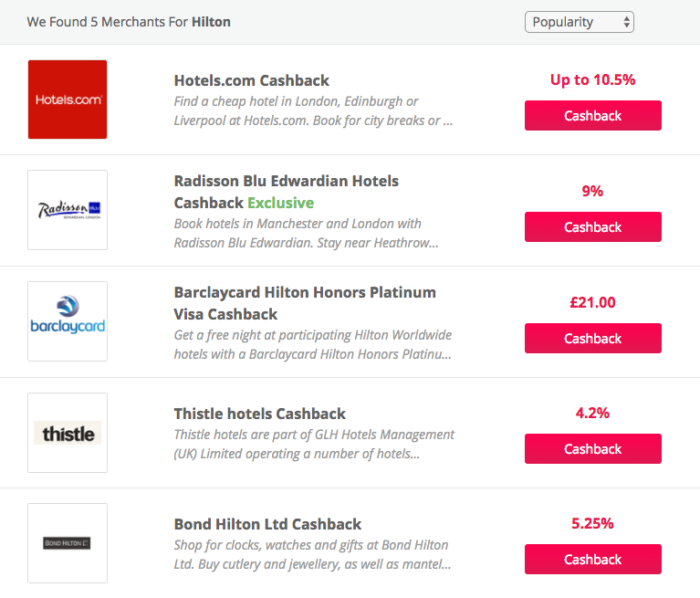 We’re big fans of Hilton, here at InsideFlyer UK and we’re also big fans of cashback. 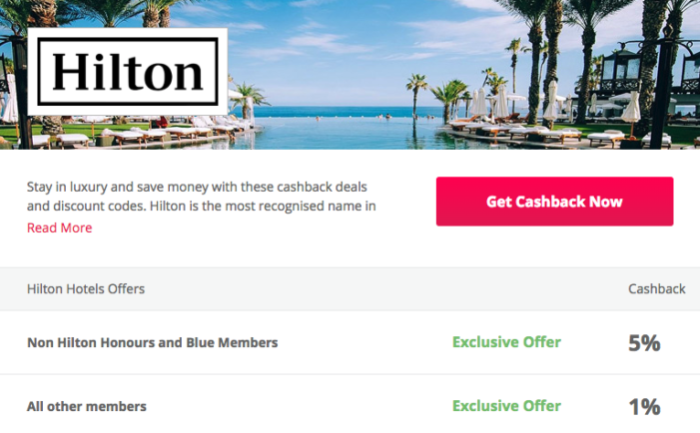 Since Hilton disappeared from the two major UK cashback sites, TopCashback and Quidco we’ve had to look elsewhere for a ‘kickback’ on Hilton bookings. Opening an account with TopCashback.com isn’t for everyone. You get paid in dollars for a start, and you can’t transfer to a UK bank account or Avios, which are our favoured choices. However, you can transfer to PayPal, Amazon.com, Walmart and handful of other e-gift cards. If you have a US mailing address, you have other options such as American Express gift cards which may work if you are regularly in the US and have an office, or other address you can receive mail at. Be aware of the small print, especially regarding upgrades (I’ve never had a problem and regularly get upgraded as a result of status, but it’s in the small print, so could be a risk occasionally). “Stated reward is for all bookings except US, Canada, Asia Pacific & South America hotels which you will receive a lower reward. Rewards will not be approved until 90-120 days after you have completed your stay. If any changes are made to your booking (i.e. room upgrade or amending the date of the stay) it may cause the rewards to be invalid. Queries can only be investigated after your booking (stay) is complete. Avios and dollars aren’t for everyone, and if you’re set on boosting your Hilton Honors balance, then the current promotion for booking via the app might work for you. It’s pretty simple, book via the app and get 500 Honors points PER BOOKING. This is important, as you get 500 points if it’s one night, or five. You might want to jump between hotels for longer stays (and then again, you might not!) to maximise the points. A critical distinction with this offer, is that it applies to reward stays as well as paid stays, so think of it as 500 points off your redemption cost. Now, they have a similar approach to loyalty as the US site, but if it’s cash (or any of the other payout options offered) that you’re after then this may work for you. You should be able to access the above merchant page via this link, or by clicking on the above image. It may be that I have been targeted by TopCashback for this merchant offer, but they did a bad job of telling me if that is the case (i.e. they didn’t!). I’ve checked with a handful of people and going straight to the above link shows the same offer, but of course YMMV, so don’t rely on this to pay your mortgage! That really depends on your own situation. If you have so many Avios you can’t get rid of them quick enough before dynamic pricing comes in, then the e-store may not be for you. 500 Honors points on their own aren’t going to do a whole lot for you, and 1% is not a very satisfying rebate unless you’re spending an awful lot of somebody’s else money. For me, the Avios e-store is the clear winner, but that’s because I find regular use for large quantities of Avios to visit family overseas along with my trusty BA Premium Plus 2-4-1 voucher. The Hilton app bonus is the no-brainer for redemption bookings. Based on these numbers, bookings under £25 would also be best booked via the app. 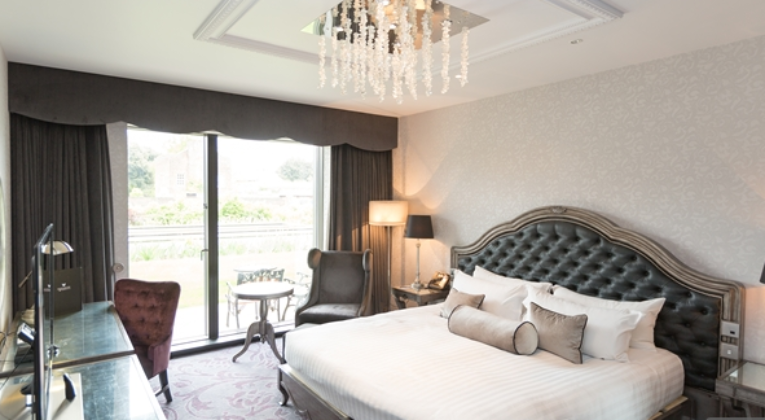 If you find a Hilton in the UK for under £25/night, let me know via the comments and I’ll move in until the end of the year to re-qualify as Diamond!! Don’t forget the values of points and miles can change with a devaluation, and if you have no use for them, they are practically worthless, so for many people the cash could be the best option and it seems TopCashback are (quietly) offering this. 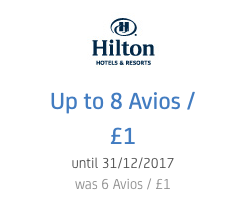 Also recall, if you saved the Hilton ‘Spend £250, get £50 back’ offer to your American Express, that should stack with any of these for stays over £250, plus whatever rewards you get on your American Express. Could make for a handy rebate on your travel spending. So do you think that if I booked via eStore and then used Best Rate Guarantee policy to lower the price, I may not get points? The Ts and Cs don’t specifically mention that, and only changes to dates or room upgrades. Depending on what the BRG is worth, I would decide which is worth more to you and don’t bank on both.